We have made these changes (updated 5-23-18) to better explain our privacy practices to you and to reflect changes required by the European General Data Protection Regulation (GDPR). If you are located outside of the European Union. In order to process any order we need and will retain only your name, address and email address. This data is also available to Google Analytics which provides data about how you found us (search engine, reference links from other sites and the like. We are in no way building, retaining or establishing profiles, we only have this available so we can better optimize our site based on your interests. Periodically (usually about 1-2 times a month via a third party email program called Constant Contact) we send a newsletter to anyone that has opted in to receive these. You can opt in or out at any time by signing up here or opting out by clicking the unsubscribe link found at the bottom any newsletter. Your order will be processed by an encrypted secure server to safeguard your credit card and other sensitive details. We do not have access to any of your credit card account number information other than the last 4 digits and expiration date. Your information is only used to process your order, we do not sell or distribute any of your personal data. We do not have any affiliate programs or relationships with any other third party for the purposes of sharing information. Our only relationship is with you. We take your trust in us very seriously and will never breach the confidence you have placed with us. Aloha Shirt Shop accepts all major credit cards including Visa, Mastercard, American Express and Discover. We also welcome all bank debit cards. No pin number necessary. Additionally for your convenience we offer Paypal checkout. We are also pleased to accept payment by money order or personal check. By selecting this method your order will be pulled and held awaiting payment by mail. If payment is not received within 10 days your order will be considered canceled. All apparel items on the Aloha Shirt Shop website are shipped for free within the U.S. for the entire order using standard shipping, normally first class mail. Any back ordered item(s) from original order will also be shipped free of shipping charges. Most items are shipped by USPS first class or priority mail, UPS or Fed Ex ground services. We reserve the right to select the method we wish to use. Most items will arrive in 2-7 days from shipment date, depending on service selected. We make every effort to ship each order the same day it is received. Occasionally due to back orders from manufacturers and other matters beyond our control, orders can be delayed as much as 2-3 days at best, longer occasionally. If you have special requirements please note them in the comments section of the order form. We will make every effort to accommodate. Express shipping is available for additional costs. Express is defined as standard 2 day delivery. We have a fixed price of $21.90 for up to 3 clothing items. 4 or more items will be a flat rate of $46.00. We use USPS and UPS and again reserve the right to choose which carrier at our discretion. All services provide tracking numbers. Express orders must be received no later than 2:30 pm PST to assure second day arrival. Any order received after that time will be shipped on the next business day. Our express charges do not include Sunday delivery so any order placed after the 2:30 pm on Friday will be delivered the following Monday. Please call for details. Express service is not available to Hawaii, Alaska or any other location outside of the contiguous 48 states. We do offer actual overnight delivery but at a substantial additional charge, usually approximately $60.00. This is dependent on geographic location and level of service. We are not responsible for weather, equipment or other acts, natural or unnatural, that might delay service. We gladly and proudly accept orders from our overseas military and civilian personnel. Simply choose correct designation in shipping choices at checkout. Fill in your complete billing information and complete APO address. Your order will be shipped via USPS priority mail. Shipping is free as long as we are shipping to a U.S. APO zip code. We will attach any necessary customs forms. Most international shipments are made by Global International mail. 1-2 clothing items can be shipped most places in the world for a flat rate of $22.90. This service does have a customs tracking number, we use it frequently and it is very reliable. 3-4 clothing items is a flat rate of $35.90. 5+ items is a flat rate of $564.90. Delivery time via International First Class mail is usually 7-12 business days. Global Priority EMS (Express Mail Service) is available for a price between $59.50 (1-3 items) - $89.00 (4 or more items). Delivery is usually 3-5 business days. We ship only clothing items internationally. Customs and duty charges are the responsibility of the purchaser. We will make every effort to legally keep this to a minimum by mailing your invoice separate from the package and posting a very reasonable valuation. Note: Due to customs restrictions with select destinations, promotional (or free) items may not be included in all orders. This varies by country restrictions. Only unwashed and with tags attached items will be accepted for a period of 30 days from date of receipt. Any item returned more than 30 days from date of receipt will be subject to a 20% restocking charge. No items will be accepted for return or exchange past 90 days from date of order. Note: All Holiday purchases made between November 1st and December 23rd may be returned at any time before January 20th without any restocking charge. You must have a receipt enclosed for refund. No exceptions. We will not accept items for return purchased from anywhere but Aloha Shirt Shop. Clearly identify what you would like us to do: (Same print - different size, different print with correct size stated, refund, etc.). Please button and fold your item carefully. Please note: customers are responsible for the return shipping. We do not provide return labels. If exchanging, we will ship exchange item back to you free of charge to any location within the U.S.
For international returns or exchanges, we are not responsible for shipping fees either inbound or outbound. Any re-ship will require an additional $19.80. Please enclose your contact phone number and a clear, legible return address. We will process your request the same day it arrives. Any refund due will be processed the same day it arrives and you will be e-mailed a copy. Any return that results in a refund and had previously used Big Kahuna rewards points as partial payment will be refunded the actual payment amount only and points will not be returned to your account. We welcome special orders and requests, however any items that are special ordered for either an individual or group request are non returnable. This includes all group purchases of 12 or more items. A special order is defined as any item or size of item that does not appear on this site at the time of order (placed by phone or e-mail as a special request or bulk order), or, is ordered in quantities that exceed our normal stock inventory amounts. Probably the most frequent question we receive is about sizing. And probably the simplest answer we can give is this. If you think of yourself as a large or extra large etc., then you probably are. Our clothing comes from the finest companies in the industry. As with all better quality clothing, very strict guidelines are used to produce each piece. Each manufacturer will use the same basic size standards, although there may be a variance of 1/2 inch in the charts shown below. Hawaiian wear is intended to be worn loosely and comfortably. After all, one of the great joys of our products is the cool, casual and comfortable (fit and lifestyle) they provide. Please note: Not all items are available in the sizing charts shown. Please refer to the pull down menu below each item. Also, not all brands are going to fit the same. This is a basic guideline. Within the product details page for each item, we have noted whether a particular shirt seems to run larger, smaller, or as expected. 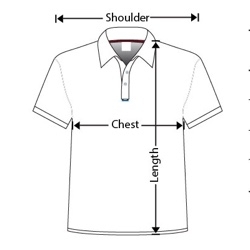 Measurements below are guidelines for the actual sizes of our clothing and are not the same as your measurements. For best fit, measure a comparable existing item that fits you the way you would want your new item to fit. Lay it flat and compare those measurements with the charts below. When in doubt order the size you are most used to wearing. Remember, Aloha wear is designed to be worn loose and comfortable. International conversions from centimeters to inches can be found here and kilograms (or other) to pounds here. Small 21" 19" 28 1/2"
Large 25" 21" 29 1/2"
X-Small 32" 30" 36" 36"
Small 34" 32" 37" 37"
Medium 36" 34" 38" 38"
Large 40" 38" 42" 40"
X-Large 41" 40" 44" 41"
2X-Large 42" 41" 46" 42"
X-Small 32" 30" 36" 50"
Small 34" 32" 37" 52"
Medium 36" 34" 38" 53"
Large 40" 38" 42" 54"
X-Large 41" 40" 44" 54"
2X-Large 42" 41" 46" 55"
X-Small 35" 23 1/2" 8 1/2"
Medium 39" 24 1/2" 9 1/2"
X-Large 44" 25 1/2" 10 1/2"
2X Large 46" 26" 11"
Each clothing item will have a care or cleaning tag attached. Read these tags carefully. For best results we recommend cold wash and cool or hang dry. Most silks require dry cleaning by a reputable cleaner. Some silks are hand washable and hang dry. Please consult the care instruction tag attached inside each shirt. For foolproof care, turn to your local professional cleaners. You have an investment, both monetarily and emotionally in your new clothing. When in doubt please call us or refer to your local professional. If you follow these instructions your new items will retain size and color for years to come. We will not be responsible for clothing that is shrunk or otherwise damaged by not following proper care instructions. The only thing that will shrink clothing is heat from either the wash or the drying process. Cotton Lawn - A light, fine cloth made using carded or combed linen or cotton yarns in a plain weave. The fabric has a crease-resistant, crisp finish. The name derived from Laon, a city in France, where linen lawn was manufactured extensively. It is light weight, sheer, soft, and washable. It is crispier than voile but not as crisp as organdy. When made with fine high count yarns, it has a silky feel. Comes in white or may be dyed or printed. Spooner Kloth - A trademarked Reyn Spooner name for a cotton polyester blend. As described by Reyn Spooner: Introduced by Reyn Spooner® in 1964, this traditional classic has become the oxford cloth of the islands. Combining the cool comfort of combed cotton with the wrinkle free properties of spun polyester, Spooner Kloth™ is guaranteed to give years of wash n wear durability. Due to its unique nature, the slight irregularities in weaving and subtle variations in color that occasionally occur are natural characteristics of this woven fabric. Spooner Kloth™ fabric will continue to develop its personality and improve with age. Rayon or Viscose - A manufactured fiber of natural composed regenerated cellulose, derived from wood pulp, cotton linters, or other vegetable matter. One of the most peculiar fabrics in use today. Strictly speaking, it is not an artificial fiber, because it is derived from naturally occurring cellulose. It is not, however, a natural fabric, because cellulose requires extensive processing to become rayon. Rayon is usually classified as a manufactured fiber and considered to be "regenerated cellulose". Rayon is the oldest manufactured fiber, having been in production since the 1880s in France, where it was originally developed as a cheap alternative to silk. Modal - Considered a type of rayon, modal is made only from beechwood fibers. Most other rayons are made of the wood pulp of a number of different trees. Like other types of rayon, which were originally marketed as "artificial silk," modal is soft, smooth and breathes well. Its texture is similar to that of cotton or silk, and it's cool to the touch and very absorbent. Like cotton, this textile dyes easily and becomes color-fast after submersion in warm water. Lyocell / Tencel - A high-performance fiber used to make soft, beautifully draping rayon fabrics. It is a strong, easy-care fabric made of cellulose extracted from wood pulp that is harvested from replenished tree farms. It's environmentally sensitive and washable. This elegant eco-fiber is derived using a non-toxic process, which spins it into a buttery-soft machine washable textile, both luxurious and upscale. Tencel is 100% biodegradable, durable, dyeable, and machine washable/dryable. It is elegant and ultra-soft, offering an incredible drape and versatility. Polynosic - Polynosic is a type of microfiber that is a blend of advanced polyester and rayon fibers. Characteristics include luxurious soft touch and excellent drape. Features similar characteristics to cotton and silk, has excellent luster and very little shrinkage.